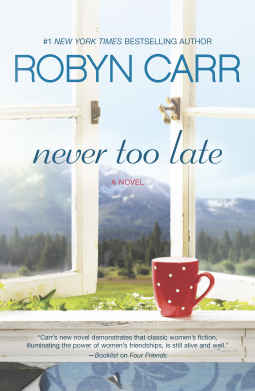 Never Too Late by Robyn Carr is the story of three sisters and second chances. Clare the middle sister, has finally had it with her husband Roger, he has cheated on her once too often. In spite of repeated assurances that he is getting counselling nothing seems to change. Sarah, the youngest, has let herself go and has thrown herself into her art and work. Yet when she sees Clare with Sam, a young police officer - about ten years younger than Clare, something is triggered within her and she surprises both her sisters with her step back into the swing of life. Maggie is the oldest of the sisters, she is happily married, with two daughters. She is a successful lawyer, attractive and intelligent - like her sisters. Yet there is one part of her life that she is not happy with, and seeing her sisters obviously becoming 'lucky', she pushes for what would completely make her happy. Could it be a simple solution - perhaps! As well as having Sam's attention, Clare is also reconnecting with an old friend - Pete. Pete is the brother of Clare's first love, but unfortunately he died young. Pete and Clare have a history though, and its one Clare is determined to face and deal with. I liked this book because of the challenges it threw up to the characters and the way they responded. It wasn't only the women who grew and developed. The men too, had their chance and on the whole took those small steps where it counted. Roger lost his wife because of his inability to be faithful, however he is strongly motivated to be a good father to Jason their son. Will he be successful? Can Sam recognise who he really loves? Will Maggie's husband recognise her distress and will he step up to the plate? There is a strong sense of family and the support a good family gives when someone is in difficulty in Never Too Late. In life we all make mistakes, and the support of family often get us through them. Issues of parenting are explored on a wide variety of fronts. Strong, honest communication is a stand out point in the book and I believe was a factor in a variety of issues being successfully dealt with. Another wonderful Robyn Carr book, I read this book five years ago! To be honest I remembered very little of it, so it was a very enjoyable read. It makes me wonder whether I should pick up more books on my keeper shelf and reread them! I agree, I think I have quite a few "fresh starts" sitting on my shelves. Anna so identify. So many books, I often think of that, just as well there are such a variety of readers. I reckon no two readers are alike! I'm glad you liked this one too. I have several Robyn Carr titles to get to. Thanks for sharing.